Some relics, such as remnants of the Crown of Thorns, receive only a modest number of pilgrims, while others, such as the Shroud of Turin, receive millions of pilgrims, including Pope John Paul II and Pope Benedict XVI. As Christian teaching generally states that Christ was assumed into heaven corporeally, there are few bodily relics. A notable exception is the Holy Foreskin of Jesus. The "True Cross" refers to the actual cross used in the Crucifixion of Jesus. Today, many fragments of wood are claimed as True Cross relics, but it is hard to establish their authenticity. The story of the fourth-century discovery of the True Cross was reported in Jacopo de Voragine's The Golden Legend published in 1260. that included the lore of saints venerated at the time. Tradition and legend attribute the discovery of the True Cross to Saint Helena, mother of Constantine the Great who went to Palestine during the fourth century in search of relics. Eusebius of Caesarea was the only contemporary author to write about Helena's journey in his Life of Constantine. But Eusebius did not mention the True Cross, although he dwelt on the piety of Helena and her reporting the site of the Holy Sepulchre. In the fifth century writings by Socrates Scholasticus, Sozomen and Saint Theodoret report on the finding of the True Cross. Pieces of the purported True Cross, including half of the INRI inscription tablet, are preserved at the basilica Santa Croce in Gerusalemme in Rome. Other small pieces of the True Cross are reportedly preserved in hundreds of other European churches. 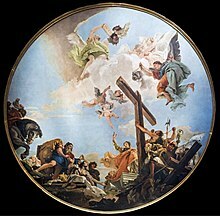 The authenticity of the relics and the accuracy of reports of finding the True Cross is not accepted by all Christians. The belief in the Early Christian Church tradition regarding the True Cross is generally restricted to the Catholic and Eastern Orthodox Churches. The medieval legends of the True Cross provenance differ between Catholic and Eastern Orthodox tradition. These churches honour Helena as a saint, as does also the Anglican Communion. A number of acheiropoieta (i.e. not made by hand) images reported to be of the face or body of Jesus impressed on cloth have been displayed. In most cases these images are subject to intense debate and speculation. 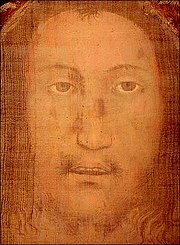 Although devotions to the face of Jesus are practiced, the term "Holy Face of Jesus" relates to the specific devotions approved by Pope Leo XIII in 1895 and Pope Pius XII in 1958 for the image from the Shroud of Turin. The Shroud of Turin is the best-known and intensively studied relic of Jesus. The validity of scientific testing for the authenticity of the Shroud is disputed. Radiocarbon dating in 1988 suggest the shroud was made during the Middle Ages. Arguments against the 1988 carbon dating results include conflicts in the interpretation of the evidence, that samples were from a non-representative corner, and the presence of additional carbon content because of fire damage. Pollen residues on the Shroud provide evidence for an origin in the Jerusalem area before the 8th century. Both skeptics and proponents have entrenched positions on the Shroud's authenticity, often pitting science against divine formation preventing a dialogue to resolve the issue to the satisfaction of all. The Sudarium of Oviedo is a bloodstained cloth, measuring c. 84 × 53 cm, curated in the Cámara Santa of the Cathedral of San Salvador, Oviedo, Spain. The Sudarium (Latin for sweat cloth) is claimed to be the cloth wrapped around the head of Jesus Christ after he died, noted in the Gospel of John (20:6–7). The Sudarium is soiled and crumpled, with dark flecks that are symmetrically arranged but do not form an image as with the Shroud of Turin. Proponents for the relic's authenticity, such as Vatican archivist Msgr Giulio Ricci,  contend that both cloths covered the same man. The Image of Edessa is also known as the Mandylion. Two images are claimed to be the Mandylion: the Holy Face of Genoa at the Church of St. Bartholomew of The Armenians in Genoa and the Holy Face of San Silvestro, curated in the Church of San Silvestro in Capite in Rome until 1870, and now in the Matilda Chapel of the Vatican Palace. That the Mandylion is in fact the Shroud of Turin is the subject of debate. The Veil of Veronica, used to wipe the sweat from Jesus' brow as he carried the cross, is claimed to bear the likeness of the face of Christ. Today, several relics are claimed to be the Veil of Veronica. An image kept in Saint Peter’s Basilica in Rome is purported to be the Veil of Veronica revered in the Middle Ages. The most detailed recorded inspection in the 20th century occurred in 1907 when Jesuit art historian Joseph Wilpert inspected the image. The Hofburg Palace in Vienna has a copy of the Veil of Veronica, identified by the 1617 AD signature of the secretary of Pope Paul V, during whose reign a series of six copies of the veil were made. The image at the Monastery of the Holy Face in Alicante, Spain was acquired by Pope Nicholas V from relatives of the Byzantine Emperor in 1453 and placed in Alicante in 1489. The Jaén Cathedral in Spain has a copy of the Veronica which probably dates from the 14th century Siena, known as the Santo Rostro and acquired by Bishop Nicholas de Biedma. In 1999, Father Heinnrich Pfeiffer announced at a press conference in Rome that he had found the Veil in the Capuchin monastery in the village of Manoppello, Italy, where it had been since 1660. This Veil is discussed in Paul Badde's 2010 book The Face of God. 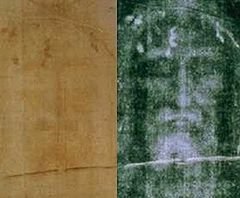 Advocates of the Shroud's authenticity claim that the face of the Manoppello Image corresponds to the face presented on the Shroud of Turin and the blood stains on the Sudarium of Oviedo. [unreliable source?] 3D properties of the Manoppello Image are reported. Several Holy Chalice relics are reported in the legend of Holy Grail, though not part of Catholic tradition. Of the existing chalices, only the Santo Cáliz de Valencia (English: Holy Chalice of the Cathedral of Valencia) is recognized as a "historical relic" by the Vatican, although not as the actual chalice used at the Last Supper. Though not claiming the relic's authenticity, both Pope John Paul II and Pope Benedict XVI have venerated this chalice at the Cathedral of Valencia. Very little reliance can be placed upon the authenticity of the thirty or more holy nails which are still venerated, or which have been venerated until recent times, in such treasuries as that of Santa Croce in Rome, or those of Venice, Aachen, Escurial, Nuremberg, Prague, etc. Probably the majority began by professing to be facsimiles which had touched or contained filings from some other nail whose claim was more ancient. Many churches claim to have relics from the Crown of Thorns placed on the head of Jesus by the soldiers prior to his crucifixion. The Scala Sancta, the stairs from Pontius Pilate's praetorium, ascended by Jesus during his trial were also reportedly brought to Rome by Saint Helena of Constantinople in the 4th century. The Basilica of the Holy Blood in Bruges, Belgium, claims a specimen of Christ's blood on a cloth in a phial, given by Thierry of Alsace after the 12th century. The Holy Coat: The possession of the seamless garment of Christ (Latin: Latin tunica inconsultilis; John 19:23), for which the soldiers cast lots at the Crucifixion, is claimed by the cathedral of Trier, Germany, and by the parish church of Argenteuil, France. The Argenteuil church claims that their Holy Coat was brought by Charlemagne. The crucifixion site called Golgotha, is in the Church of the Holy Sepulchre in Jerusalem. Inside the church the crucifixion site consists of a pile of rock about 7 metres (23 ft) long by 3 metres (9.8 ft) wide by 4.8 metres (16 ft). The Iron Crown of Lombardy and Bridle of Constantine are allegedly made from the Holy Nails. The Holy Lance is the spear used by the Roman soldier Longinus to pierce Jesus' side when he was on the cross. The Holy Sponge, is reported to be in church Santa Croce in Gerusalemme in Rome. The Column of the Flagellation, which Jesus was tied to during the Flagellation of Christ, is reportedly in the Basilica of Saint Praxedes in Rome. The relics of the Passion presented at Notre-Dame Cathedral in Paris include a piece of the True Cross from Rome as delivered by Saint Helena, along with a Holy Nail and the Crown of Thorns. Saint John tells that, in the night between Maundy Thursday and Good Friday, Roman soldiers mocked Jesus by placing a thorny crown on his head (John 19:12). The crown is a circle of cane bundled together and held by gold threads. The thorns were attached to this braided circle, which measures 21 centimetres in diameter. The seventy thorns were reportedly divided up between the Byzantine emperors and the Kings of France. The accounts of pilgrims to Jerusalem report the Crown of Thorns. In 409, Saint Paulinus of Nola states the Crown was kept in the basilica on Mount Zion in Jerusalem. In 570, Anthony the Martyr reports the Crown of Thorns in the Basilica of Zion. Around 575, Cassiodorus wrote, "Jerusalem has the Column, here, there is the Crown of Thorns!" Between the 7th and the 10th centuries, the Crown of Thorns was moved to the Byzantine emperors' chapel in Constantinople for safekeeping. In 1238, the Latin Emperor Baldwin II of Constantinople pawned the relics for credit to a Venetian bank. Saint Louis, the king of France redeemed the Crown from the Venetian Bank. On 10 August 1239, the king deposited 29 relics in Villeneuve-l'Archevêque. On 19 August 1239, the relics arrived in Paris. Wearing a simple tunic and with bare feet, the King placed the Crown of Thorns and other relics in the palace chapel in a structure he commissioned. During the French revolution, the relics were stored in the National Library. After the Concordat in 1801, the relics were given to the archbishop of Paris who placed them in the Cathedral treasury on 10 August 1806. Since then, these relics have been conserved by the canons of the Metropolitan Basilica Chapter, who are in charge of venerations, and guarded by the Knights of the Order of the Holy Sepulchre of Jerusalem. Napoleon I and Napoleon III each offered reliquaries for the crown of thorns. They were on display at Notre-Dame Cathedral during scheduled religious ceremonies, until a serious fire struck the cathedral on 15th April, 2019. St. Paul's Monastery on Mount Athos claims to have relics of Gifts of the Magi, while Dubrovnik's Cathedral, Croatia, claims to have the swaddling clothes the baby Jesus wore during the presentation at the Temple. The knife used by Jesus during the Last Supper was also a matter of veneration in the Middle Ages, according to the 12th-century Guide for Pilgrims to Santiago de Compostela. According to French traveler Jules-Léonard Belin the knife used by Jesus to slice bread was permanently exhibited in the Logetta of St Mark's Campanile in Venice. ^ a b Thurston, Herbert (1913). "Holy Nails" . In Herbermann, Charles (ed.). Catholic Encyclopedia. New York: Robert Appleton Company. ^ "NPNF2-01. Eusebius Pamphilius: Church History, Life of Constantine, Oration in Praise of Constantine - Christian Classics Ethereal Library". www.ccel.org. ^ "Saint Helena Queen and Widow". anglicancatholic.org. Retrieved April 10, 2015. ^ "The Shroud of Turin is the single, most studied artifact in human history" statement considered as "widely accepted" in Lloyd A Currie, The Remarkable Metrological History of Radiocarbon Dating [II] Archived 2010-12-06 at the Wayback Machine, J. Res. Natl. Inst. Stand. Technol. 109, 2004, p. 200. ^ Damon, P. E.; D. J. Donahue; B. H. Gore; A. L. Hatheway; A. J. T. Jull; T. W. Linick; P. J. Sercel; L. J. Toolin; C. R. Bronk; E. T. Hall; R. E. M. Hedges; R. Housley; I. A. Law; C. Perry; G. Bonani; S. Trumbore; W. Woelfli; J. C. Ambers; S. G. E. Bowman; M. N. Leese; M. S. Tite (February 1989), "Radiocarbon dating of the Shroud of Turin", Nature, 337 (6208): 611–615, doi:10.1038/337611a0, retrieved 2007-11-18. ^ Gove, H E (1990), "Dating the Turin Shroud-An Assessment" (PDF), Radiocarbon, 32 (32:1, 87–92): 87–92, doi:10.1017/S0033822200039990, retrieved 2009-06-27. ^ Joe Nickell. "Claims of Invalid "Shroud" Radiocarbon Date Cut from Whole Cloth". Skeptical Inquirer. Committee for Skeptical Inquiry. Retrieved 2009-10-06. ^ Lorenzi, Rossella. "Shroud of Turin's Authenticity Probed Anew". Discovery Channel. Discovery Communications. Archived from the original on 2008-04-03. Retrieved 2008-03-30. ^ XVI International Botanical Congress. "Botanical Evidence Indicates 'Shroud Of Turin' Originated In Jerusalem Area Before 8th Century". ScienceDaily. ScienceDaily, 3 August 1999. <www.sciencedaily.com/releases/1999/08/990803073154.htm>. ^ Michael McDonnell (2007). Lost Treasures of the Bible. ISBN 1-84753-316-7. page 31. ^ The Face of God: The Rediscovery of the True Face of Jesus, Igantius Press, Paul badde, 2010. ^ Thurston, Herbert (1913). "Chalice" . In Herbermann, Charles (ed.). Catholic Encyclopedia. New York: Robert Appleton Company. ^ "Notre Dame fire: Paris Fire Brigade chaplain braved the blaze to rescue cathedral treasures". 2019-04-17. ^ "Where to See Religious Relics in Rome, Italy". about.com. Bella, Francesco; Carlo Azzi (2002). "14C Dating of the 'Titulis Crucis'" (PDF). Radiocarbon. University of Arizona. 44 (3): 685–689. doi:10.1017/S0033822200032136. Retrieved 2012-09-10. Benford, M. Sue; Joseph G. Marino (July–August 2008). "Discrepancies in the radiocarbon dating area of the Turin shroud" (PDF). Chemistry Today. 26 (4). Archived from the original (PDF) on 2012-03-04. Retrieved 2012-09-10. Fernández Sánchez, José Luis (4–6 May 2010). "The Sudarium of Oviedo and the Shroud of Turin. A question of authenticity" (PDF). Proceedings of the International Workshop on the Scientific approach to the Acheiropoietos Images, ENEA Frascati, Italy. This page was last edited on 23 April 2019, at 18:58 (UTC).